I made some of the biscotti that I gave you the recipe for in an earlier post. This time I decided to take a photo of it so you could see just what it would look like! Please ignore the filthy vase in the background, as these flowers are past their prime and I just haven't gotten around to tending to them yet. (I know -- how horrible of an example to set, especially on this blog! I usually don't let them get this way, I promise!) 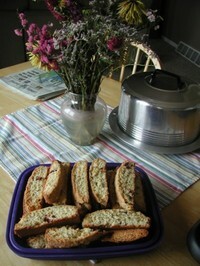 Anyway, these biscotti are so yummy dunked in your coffee or with a nice hot cup of English Breakfast Tea. Try making it -- it's so easy, I promise.